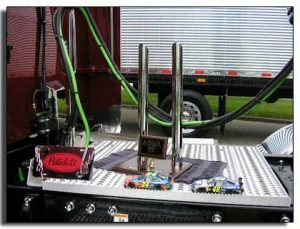 Polish, Shine & Show – Habeck Trucking, Inc. The trucks are our drivers’ passion, without a doubt Habeck Trucking drivers love their trucks. As summer show season kicks into full swing our drivers are finding time to add chrome, complete customizing projects and putting on the shine. As the kickoff to the season, many drivers were able to take a day off and enjoy the Mid America Trucking Show in Louisville KY back in February. Now, with the nice weather approaching, the drivers are taking the opportunity to make everyday a show to the general public, as they keep things shiny going up & down the roads. Delivering freight is only a part of what our drivers do well; they also are determined to be professional ambassadors for the industry and their career. South Dakota Wheel Jam, held in Huron SD the first weekend in June, allows our drivers the opportunity to bring home the trophies, and truly show off their pride. Will truck #23 bring home the prize again in ’09? Can we keep the title of “Best Fleet”? If we don’t, Habeck Trucking is certainly going to give the competition a run. Mike, Mary, Jim, and the rest of the crew have always had a love for fancy trucks. So if you have the opportunity to see a Habeck truck on the road between Portland, OR and Chicago IL or many other places throughout the US, we hope you enjoy the view too!